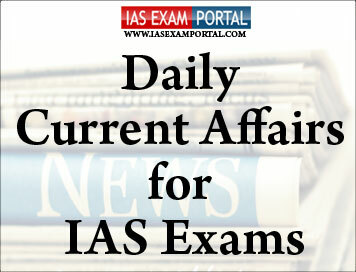 Current Affairs for IAS Exams - 8 September 2018 | IAS EXAM PORTAL - India's Largest Community for UPSC Exam Aspirants. As a consequence of CISMOA, India will get access to Combined Enterprise Regional Information Exchange System or CENTRIXS for short which is the secure communication system network of the US. Navy ships with CENTRIXS systems on board can communicate securely with the U.S. Navy when needed and can benefit from the wider situational picture of the region as they have a large number of ships and aircraft deployed. “This will reduce the stress on our assets and allow us prioritise our deployments more efficiently,” one officer said. However, there are persistent concerns that this would allow U.S. Navy access to India’s own secure communication network and also that the information shared with the U.S. will be accessible by Pakistan. “Data acquired through such systems cannot be disclosed or transferred to any person or entity without India’s consent,” another official said, adding this is an enabling instrument and does not commit India to acquire U.S. platforms. So far in joint exercises, Indian Navy used to temporarily plug in portable CENTRIXS systems to communicate with U.S. assets. Over 2,000 km of roads, streets and footpaths in Delhi have been cleared of encroachments till August 31, the Delhi Development Agency informed the Supreme Court on Friday. But the statistic, instead of impressing the Bench led by Justice Madan B. Lokur, further alarmed it about the impunity with which encroachments mushroom in the National Capital. The court even threatened to summon the DDA Vice-Chairperson in person for a “chat” after reading a recent report from the Sealing Monitoring Committee, which blamed various government agencies, including the DDA, for “shrinking away from duty”. The panel said it was not getting adequate support from the government agencies and was facing constraints to such an extent that it was not able to comply with the court’s orders. The action taken report submitted in the Supreme Court showed that 844.33 km of encroachments were cleared in the North Delhi Municipal Corporation area. Another 811.01 km was cleared of illegal constructions in south Delhi. The area of encroachments cleared in east Delhi is 601.2 km and by New Delhi Municipal Council is 11 km. Union Minister of State (Independent Charge) for Labour& Employment ShriSantosh Kumar Gangwar, led a delegation to Mendoza, Argentina for the G-20 Labour& Employment Ministers’ Meeting, held on 6-7, September, 2018. He reiterated that India is committed to job security, wage security and social security to all workers in the country. All round efforts have been made to promote job creation in India over the last few years through various schemes and programmes. He also stressed on inclusive development and signing of Social Security Agreements amongst the G-20 countries for ensuring portability of social security benefits to its workers. The Minister said that new forms of work and digital economy provides employment opportunities and flexibility in working scenario, especially for women, youth and disabled. It also opens all kinds of possibilities for women who have to make balance between work and family responsibilities. It provides flexibility in working hours for these groups and even possibility of work from home. The Government of India’s recently launched landmark scheme, Ayushman Bharat will also ensure better health care of the workers. Around 500 million workers and their families are expected to benefit through this scheme. PradhanMantriJeevanJyotiBimaYojana (PMJJY) and PradhanMantriSurakshaBimaYojana (PMSBY) have been launched to provide for insurance cover in the case of disability or death to the workers engaged in the unorganised sector. G-20 Labour and Employment Ministerial Declaration and Joint G-20 Education and Labour and Employment Ministerial Declaration were adopted and will be presented in the next summit of Leaders/ Heads of the State later this year. U.S. Defense Secretary Jim Mattis met with top Afghan leaders during an unannounced visit to Kabul on Friday, adding his weight to a flurry of diplomatic efforts to bring the Taliban to the negotiating table. His trip comes a little more than a year after President Donald Trump unveiled a revamped strategy for Afghanistan that saw him commit thousands of additional U.S. forces to the country on an open-ended basis. Mr.Mattis, on his fourth visit to Afghanistan since becoming defence chief in January 2017, met with President Ashraf Ghani and the new U.S. commander for American and NATO forces, General Scott Miller. Six U.S. soldiers have been killed in Afghanistan so far this year, the most recent happening on on Monday in an apparent insider attack. They also discussed other issues, including the peace process, security reforms, upcoming parliamentary and presidential elections, and Pakistan, according to a statement from the presidential palace. U.S. Secretary of State Mike Pompeo visited Islamabad on Wednesday where he said he was “hopeful” of resetting the troubled relationship with Pakistan, a key player in the Afghan conflict.Afghan and international players have been ratcheting up efforts to hold peace talks with the Taliban. Indian Railways has always focussed on adoption of new technologies to improve train operations and provide better passenger experience to its customers. In this series, Indian Railways has introduced various IT initiatives. Handheld Terminals (HHTs) are being provided to the Train Ticket Examiners (TTEs) to be able to check the reserved coaches, allot the vacant berths and transmit information on available berths to the subsequent stations. Over the last four years, the capacity of the website has increased to 20,000 tickets per minute starting from 2000 tickets per minute in 2014, a ten-fold increase. Apart from the capacity, the entire user experience has been improved substantially with the launch a new interface with easier navigation and standard views that enable the passengers to transact smoothly. New features have been added that enable better planning of journeys aiding the passenger to obtain confirmed tickets. Complete tendering activity of Indian Railways for procurement of goods, services & works and e-auction of scrap sale is on IREPS. IREPS system is largest such G to B portal in India. It has helped in achieving objectives of transparency, efficiency and improving of ease of doing business. Almost a dozen foreign funds across geographies such as Singapore, Mauritius and the U.S., which invest in the Indian equity markets, have started restructuring their ownership and management structure to comply with the Securities and Exchange Board of India’s (SEBI) diktat that bars Non-Resident Indians (NRIs), among others, from acting as fund managers of foreign portfolio investors (FPIs). According to people directly involved in the matter, some of the funds have initiated the process to change the key management personnel (KMP) managing the fund if such person falls in the category barred by the Indian capital market regulator. Further, lawyers dealing with such investors said that many more funds had initiated corrective action to avoid any last minute compliance issues, as any change in the KMP or the fund manager required an approval from all the offshore investors and thereafter refiling of many documents. This was a time-consuming process. NRIs, along with Person of Indian Origin (PIO) and Overseas Citizen of India (OCI), cannot manage FPI investments, and have time till December 31 to comply with the new framework. “What started out as an attempt to zero in on the human beings behind corporate entities [a good move] has taken a broader filtering of money managed by brown people,” said Mr. Parekh, who was invited early this week by a SEBI panel for his views on the SEBI decision. The current account deficit (CAD) in the first quarter of 2018-19 increased by $0.8 billion. However, as a proportion of GDP, it declined marginally to 2.4% as compared with 2.5% in the first quarter of 2017-18 as per data released by the Reserve Bank of India (RBI) on Friday. “There could be temporary blips but the fundamentals of the economy are very strong,” said Rajesh Mokashi, managing director and CEO, CARE Ratings Ltd. “There is no doubt that CAD should be viewed in several quarters. In one quarter it may increase due to some temporary distractions. Oil prices are high which is an external factor. We have huge forex reserves to deal with such issues. As per RBI data, net services receipts increased 2.1% on a year-on-year basis mainly on the back of a rise in net earnings from software and financial services. Serena inched one step closer. In routing Latvia’s Anastasia Sevastova 6-3, 6-0 in the U.S Open semifinal, the six-time U.S Open champion — overwhelmed by emotions at the end of it — showed that she is still finding new ways to win. Serena will next play in her 31st Grand Slam, bidding to win her first Major title after giving birth to her daughter last year. Should she win, she will equal Margaret Court’s record of 24 Majors.